Volume 3 of “Meanwhile…Elsewhere” did not disappoint. 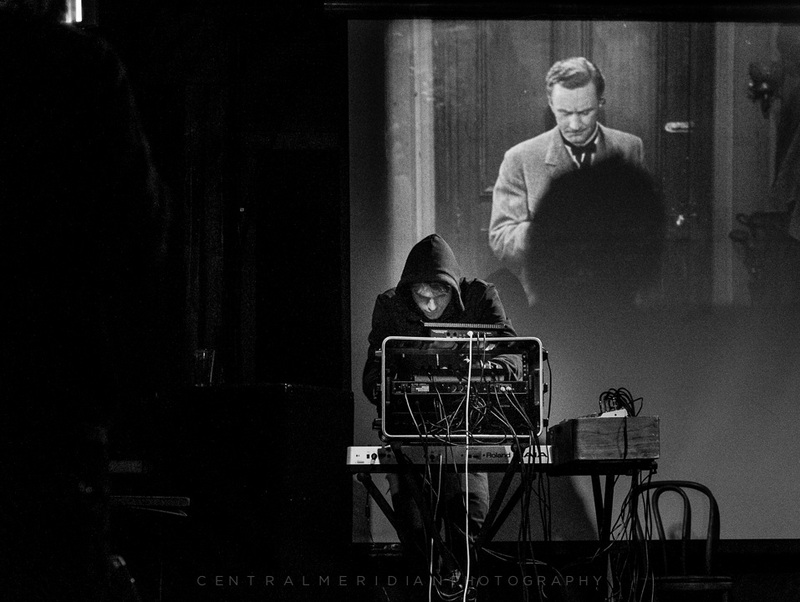 It was another great night for experimental music in Portland– six eclectic musical projects showed what this city can do while artist Colin Manning put on an otherwordly projection show. 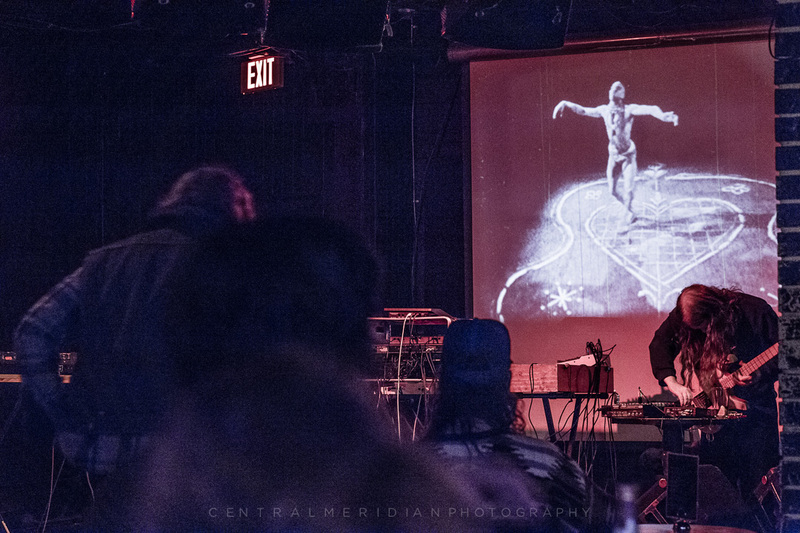 Also in the background was the eerie sound of cassettes being warped through effects pedals, courtesy of show organizers Kevin Fiske and Kieran McKeon. I didn’t have a working camera on me, but fortunately, guest Scott Mayoral was able to share some cool shots he took. 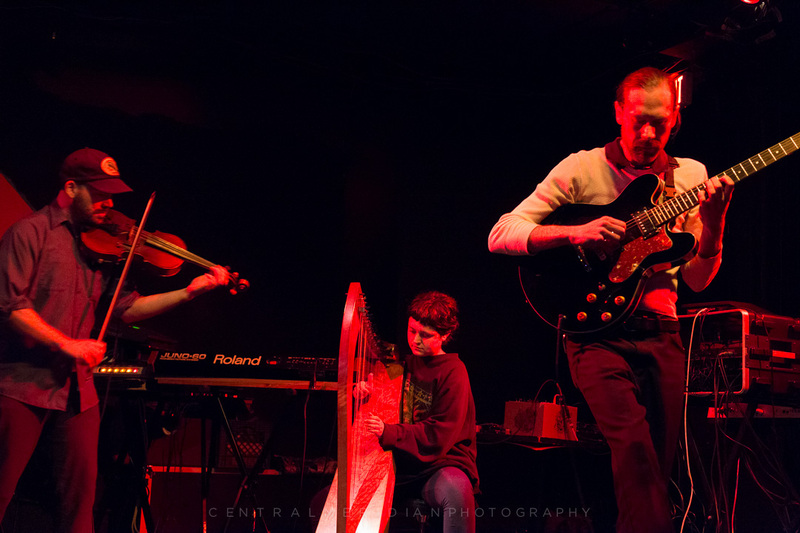 First up was Waver Clamor Bellow, a trio made up of harp, viola, and electric guitar. Maybe it’s the fact that it was a rather miserable, rainy night outside, but this group’s somber, gently wandering sound really hit the spot for me. 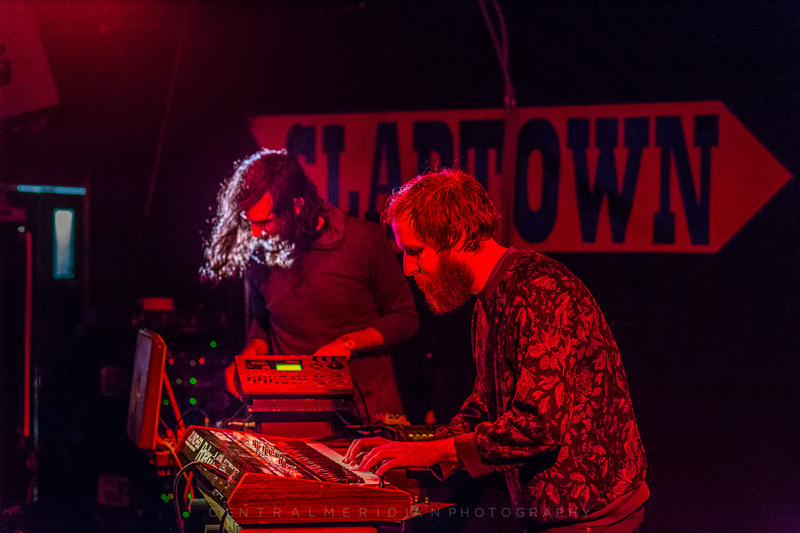 Waver Clamor Bellow takes a page or two from both folk music and Western art music with their pared-down, organic format, and in this way might remind many listeners of the glory days of some of the more austere-sounding first wave post-rock groups, like Rachel’s and Dirty Three. Their gentle, mysterious sound is a bit like a voyage into the unknown. Here is their bandcamp, give them a listen. 451 Degrees was up next with some really nice wall noise. Unfortunately I can’t link you to a bandcamp or soundcloud, so hopefully you’ll be sated with a name to look out for and these dramatic photos. 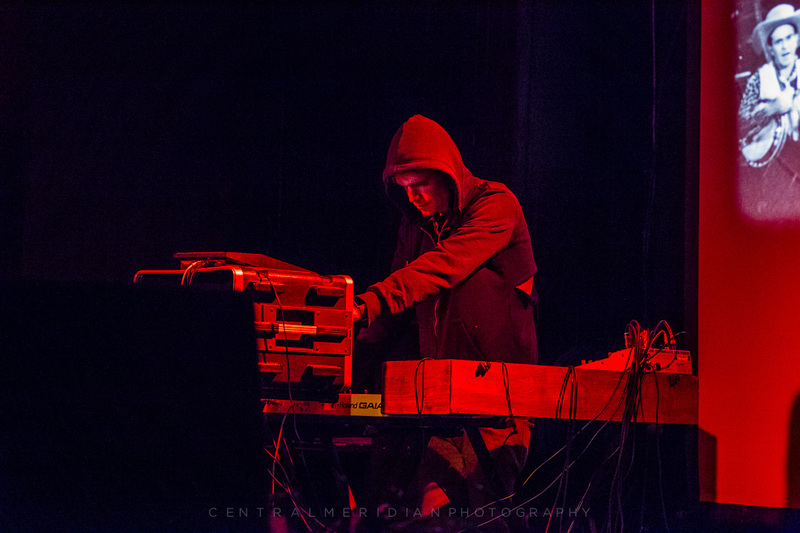 Sunken Colony, a long-standing project by Tony Remple, came on next for a relatively brief set of synth music. Sunken Colony has apparently put out a number of tapes over the years, and it is too bad I have not come in contact with any of them so far. I’ve talked with Tony, and he seems pretty knowledgeable about electronic music in general. Sunken Colony is hard-edged, but elliptical. It is probably a little closer to noise music than ambient music. I look forward to seeing more Sunken Colony in the future. Also, Tony has a radio show on XRay.Fm called Concentric Circles. Check it out on Facebook. Magisterial’s set of EDM music steered the show into the direction it stayed in for the rest of the night. 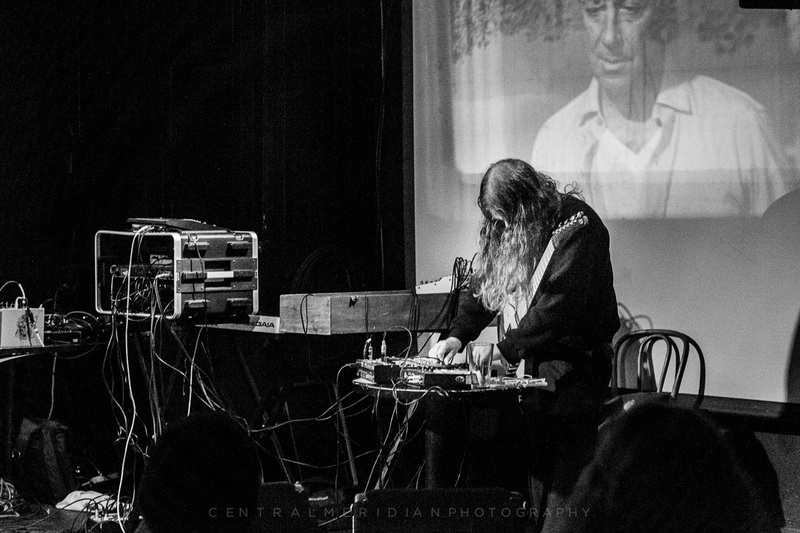 This duo made some really pleasing psychedelic dance music. Whether intentionally or unintentionally, they reminded me a little bit of some hauntology artists. A while back, they shared some shows with Swahili, another dance band from Portland that I really like. Magisterial is quality EDM with a hazy, psychedelic aesthetic. 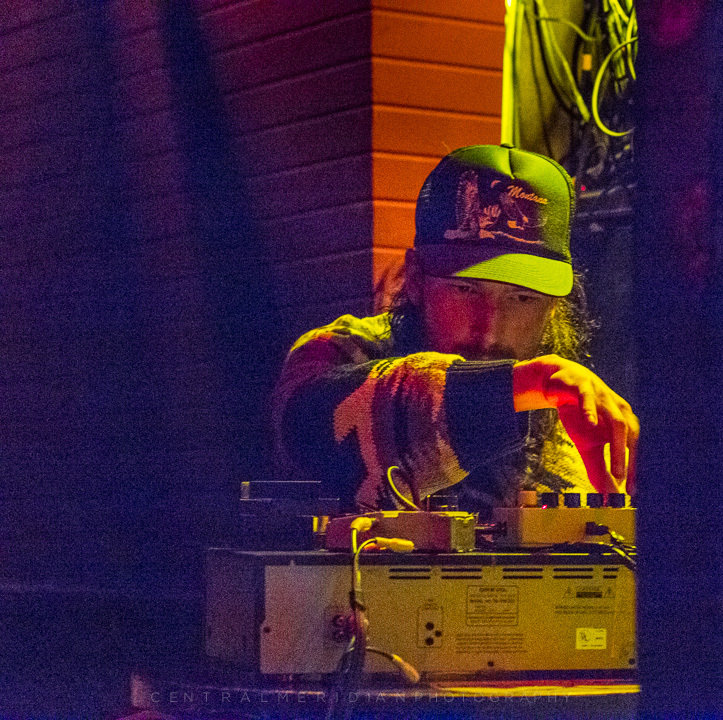 Soul Ipsum kept the ball rolling and brought the hazy energy from the last set into a meditative state with his set of warm and atmospheric vaporwave music. This was one point in the night when Manning’s projections and the music on stage went perfectly with each other. Here is Soul Ipsum’s bandcamp. 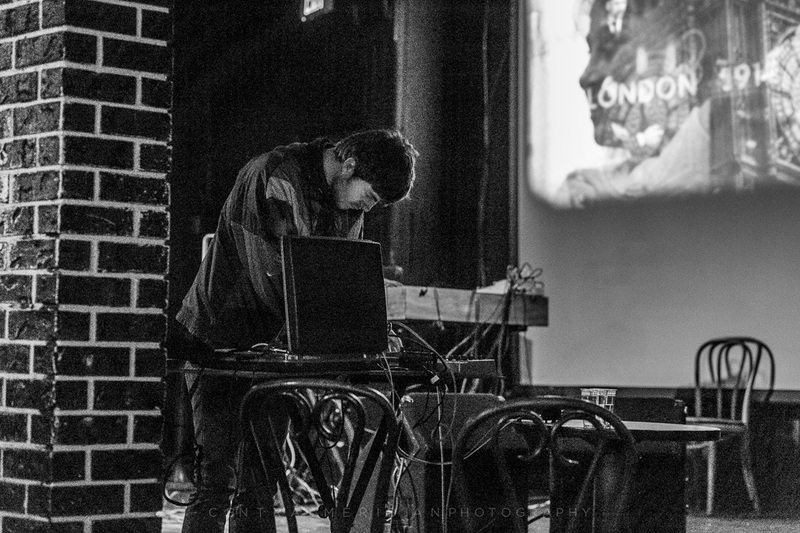 Last was Ian Gorman Weiland’s set of noisy, exploratory EDM. Nearly the whole crowd got up onstage and danced for what was apparently a mostly improvised set! This is the same Ian Weiland who was in the noise group Suzanne Lizard at the first “Meanwhile…Elsewhere”, and so he obviously has some very eclectic musical roots. This was a great way to end the night. Happy listening and see you at Slabtown next month!